Our Final Project... A Long, Yet Enriching Journey!!! This post was co-wrote with Jennifer Stewart-Mitchell. ﻿Well, here we are, at the end of the semester. Jenn and I have put in more hours than we can count into this project, but the learning journey and opportunity to ignite dialogue about true technology integration (which always has student learning at the center), has been a real rewarding experience. Under the "Overview" you can review the rationale, an informational video which explains how the C's (Essential Skills of 21st Century Learning) fit together. One of the key aspects of our project was not only developing the framework for the Essential Skills of 21st Century Learning, but to start implementing the concepts into our professional development offerings. As part of our rationale, we had decided that Digital Citizenship would be identified as just Citizenship, as there needs to be connection between the online and offline world. One aspect of our jobs is to train teachers on how to integrate the Digital Citizenship Continuum. In addition to teachers exploring the Continuum, they developed lessons using the new framework we had designed. Going forward we hope that teachers will use the framework template or at least consider the 7C's when planning. You will find our project on our division website. We hope you find our project useful and we welcome any feedback you have. We will continue to develop our project throughout the year, but we are very proud of what we have accomplished at this point in time! Summary of Learning... EdTech Funk! Below is the summary of learning that Jenn Stewart-Mitchell and I created. We were inspired by the "remix" topic in this course and decided to do our summary of learning assignment in the form of one. The song combined six different pieces of media/software together to create our final product. It took a while, but was incredibly fun to create! It was a great opportunity to not only summarize, but to apply our learning as well! It also forced us to be succinct (which is something that both Jenn and I struggle with, as we are both long-winded writers/speakers). We hope you enjoy!!! Collaborating and publishing with peers or experts using a variety of digital platforms and media (both face-to-face and online). Contributing to project teams to produce original works or solve problems. As we develop more, we will keep you up-to-date! Our Edited Identities: Is this Superficiality or Something Much Deeper? The influence of our digital connections on "identity" in a mediated world has given me a lot to reflect on this past week. The heart-wrenching story of Madison Holleran was a tough read. I found myself easily able to relate to her experiences in her first year of university. I, too, was very unhappy during my first year of university (seventeen, away from my family for the first time, going from small town to big city, etc). I am glad I made the decision to come to the University of Regina for my second year, where I felt connected and continue to feel connected to this day. Madison's story examines the pressure she felt to display a perfect (filtered) life on the outside, while she struggled with the unfiltered realities of her life on the inside (in order to coincide with what she perceived to be the reality of others). The article highlights Madison's use of Instagram and Facebook accounts and points out that "everyone presents an edited version of life on social media." For the most part, I believe that to be true. That being said, I think most people present an edited version of their life off of social media as well. As the article states, "hundreds of years ago, we sent letters by horseback, containing only what we wanted the recipient to read. Fifty years ago, we spoke via the telephone, sharing only the details that constructed the self we wanted reflected." I think this is something we need to remain cognizant of when we examine these types of stories, as many people rush to judgment to blame social media. I personally believe there is danger in the popularization of negative criticism against social media. These are social platforms, but the underlying issues are not with the mediums themselves. The only thing that has changed in the past decade is "the amount we consume of one another's edited lives." I still recall being seventeen (a time before Facebook, Instagram, Twitter, etc) and the feeling that I needed to portray something different on the outside than what I was feeling on the inside. I, too, remember walking through the halls of my former university and seeing pictures on bulletin boards of student society and residence events. I even recall appearing in many of those photos wearing (but not feeling) a smile. I remember observing how happy everyone looked and wondering what was wrong with me that I didn't feel the same way. What I didn't realize back then was that there were likely many others in those bulletin board collages that felt just like me; I wasn't making these observations through a critical lens. This past week, I decided to flip through a bunch of print pictures from my first year of university; there I am smiling in all of them. I most definitely led an edited version of my life that year. What I am trying to illustrate with this example is that the idea of living an "edited version of one's life" was not born from social media. One of our readings this week discussed the notion of social comparison theory, which was around long before social media. This theory suggests that "people have innate tendencies to track our progress and assess our self-worth by comparing ourselves to other people… lead[ing] to feelings of insignificance and insecurity." I most definitely believe that this played a significant role in Madison's story, as the article states, "the life she was curating online was distinctly different from the one she was actually living. Yet she could not apply that same logic when she looked at the projected lives of others." Teens (to varying degrees), both online and offline, experience this social-comparison and difficulty differentiating between what's projected and what's not projected. As Amy asks in her blog post, "How do we help our children to read between the digital lines?" It's a good question, and one that ought to be examined. Furthermore, we need to teach students to read between the lines in the face-to-face world as well. Everyone has their struggles; perfection does not exist. Is it necessarily a bad thing that we choose to post the highlights of our lives on social media? Does that really make one boastful? In a world where were we beat up on ourselves and on each other, is posting our highlights such a harmful thing? What about the people who choose to post all the negative things that happen in their lives? Are they being "true" people because they are more open?...or something else? Is it fair to assume that users of Facebook are "fake"? Is it fair to judge people for what they feel comfortable sharing about their lives online? As Branelle and Kirsten share in their blog posts, some things are meant to be celebrated and some things may be better off private. I do love to post updates and pictures of our family, but, for example, I wouldn't post a play-by-play of a disagreement I have with my husband. There are certain things that people prefer to keep private. Are people neglecting to reveal their whole "identity" because they choose to leave some things off of social media? As one of our readings suggests, "the antidote to comparison tends to be gratitude". Do you agree? If one is feeling down after looking at Facebook, do they lack gratitude? What a whirlwind of a week! This was a heavy week of delivering PD sessions for teachers, followed by a Maker Faire today at one of our elementary schools! Tuesday and Thursday, Jenn and I delivered PD sessions for teachers focused on 21st century learning (with a particular focus on digital citizenship) and balanced literacy. We are sharing our7 C's project with teachers as we develop it. We are hoping to transform the mindset around technology in education, to promote pedagogy and student learning when using technology tools. In the morning of our session, the focus is on one of the C's, which is digital citizenship. We have created a lesson plan template for teachers to integrate Ribble's 9 elements of digital citizenship. The template focuses on curricular outcomes and allows teachers to make connections to digital citizenship, to reinforce the idea that digital citizenship should take an interdisciplinary approach and be integrated in learning, as opposed to isolated lessons that stand alone. When presented with the template, teachers were pleasantly surprised at how seamlessly they can make the Ministry's new digital citizenship continuum fit into their already-existing lessons. To encourage another one of the C's that we consider integral to 21st century learning (collaboration), teachers were happy to share the lessons they create in this new lesson template with us. We are hoping to create a interdisciplinary bank of lessons that tie in digital citizenship, so teachers have the opportunity to borrow and re-purpose for their use. The afternoons of our sessions on Tuesday and Thursday were dedicated to meaningfully integrating technology into balanced literacy stations. As Jenn points out in her blog, the idea for the afternoon was developed from the incredible work of Tony Vincent and his call to spruce up centers with technology. The session also builds on the morning's session, as it got teachers using the common language of the 7 C's. What's more, is it is getting the students to use the common language of the 7 C's. To read more about the 7 C's that we are exploring and promoting, you can check out the flipsnack book that Jenn put together. Wednesday was TL EdCamp. We hosted an EdCamp style PD day for our Teacher Librarians, whose role is evolving into more of a media specialist. We offered several sessions throughout the day that the TLs chose to attend. I'm a big believer in personalized, and believe this model ignites meaningful learning. The feedback from the day was great and the TLs especially appreciated an hour and a half at the end of the day to apply their new learning. Today was an INCREDIBLE day! We were involved with Maker Day at one of our RCSD elementary schools. Jenn offered a coding session, another colleague offered a robotics session, another offered a wood-working session, another offered an electrical circuits session, etc. I (along with a professional DJ) offered a DJ'ing session. Seeing as Maker Days are often associated with the Math, Science, and PAA realms, you might be thinking, "What place does DJ'ing have in Maker Days?" I asked the students this question in each session, and their answers were right on! They said that DJ'ing is "making" because it involves using critical and creative thinking to make unique beats, sounds, scratches, loops, etc. Dj'ing incorporates many of the 7 C's: curating (songs and videos), citizenship (tasteful music and videos to share), collaborating (mixing songs with classmates), communicating (gathering feedback from classmates, peers, and people online), critical thinking (to think about which sonds blend together and where to add the scratches, midis, and beats), and creating (unique sounds, scratches, and beats that express them self). Even though I'm ready for a big nap after late nights and jam-packed days of presenting, facilitating, sharing and learning, I enter the weekend with an invigorated spirit. Teachers in our division are doing FANTASTIC things to make learning relevant and meaningful for students. I'm honoured to call these people my colleagues! I am also very fortunate to be working with Jenn, who works very hard and is a passionate educator influencing great momentum in our division for enhanced 21st century learning. After Jenn Stewart-Mitchell and I had the opportunity to chat with Alec and Katia on Thursday, we are excited to get the ball rolling on our final project. We are looking at influencing a transformation of mindset (meaningful integration of technology in emphasizing pedagogy over tech tools) and creating a framework for interdisciplinary digital fluency. In today’s day and age, it is imperative that students move beyond digital consumption to become both digitally literate (transactional: knowing how to use technology and what to do with it) and digitally fluent (transformational: knowing when to use technology to achieve an outcome and why the technology will help them achieve it). 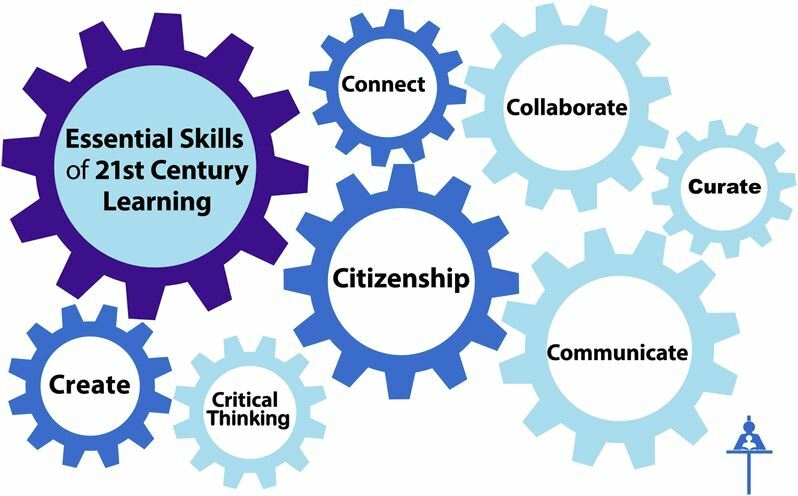 Reflecting on the work of Michael Fullen, Doug Belshaw, ISTE Standards, Partnership for 21st Century Teaching, etc, creating, critical thinking, curating, communicating, connecting, citizenship, and collaborating are skills that encapsulate digital fluency. 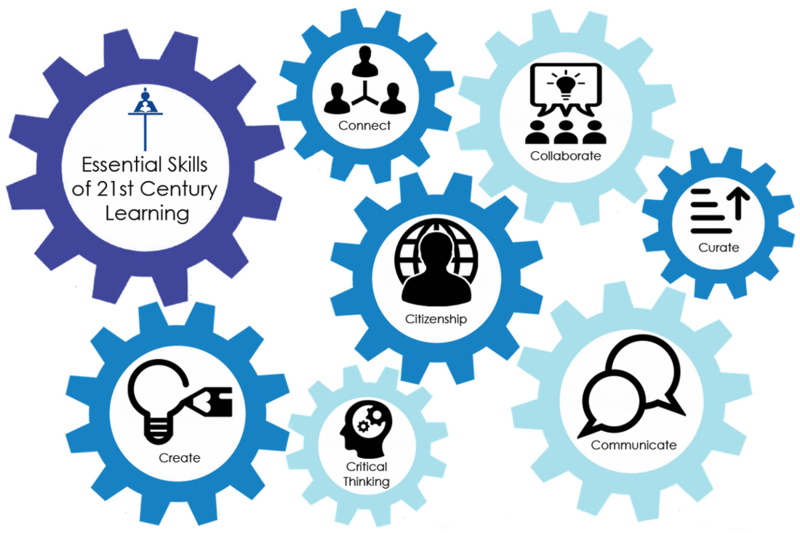 Keeping these essential skills at the forefront of teaching and learning (as opposed to specific digital devices and tools), will aid in meaningful technology integration. We believe that effectively integrating technology in (and beyond) the classroom can transform old practices and create an atmosphere that benefits all learners today and in their future. We look forward to creating something tangible to share with our school division. You can check out our proposal below. Social Saving or Social Sham﻿ing? Did you make a mistake at a young age that you later regretted? I know I made a lot of mistakes in my young life that I later regretted, and I'm going to venture to guess that you have too. Likewise, Lewinsky goes on to say, "Not a day goes by that I'm not reminded of my mistake and I regret that mistake deeply." In her talk, Lewinsky stated that "too many parents haven't had the chance to step in and rescue their loved ones [from social shaming]; too many have learned of their child's suffering after it was too late." In this blog post, I will explore something a little different: parents stepping in and sharing their child's suffering in digital spaces (without their child's consent) in order to rescue others. The news story I referred to above was entitled "Families Release Video Showing Moment 2 Men Killed in Impaired Driving Crash". This was not the boys nor their friends that released this video; it was their parents. This got me thinking about a trend I have been noticing on social media, particularly over the last year: parents digitally sharing videos/pictures of their children's fatal or life-altering mistakes. When parents share unflattering videos and pictures of their children in the hopes to save another--is this social saving (a life), or is it social shaming? How would you want to be remembered after you're gone? Would you want to be remembered for the last mistake you made? Like Lewinsky, these two young men will "be seen by many, but actually known by few". While there is no arguing that the young men were in wrong that fateful night, it is arguable that these two young men also had a good side, but that good side will never be known (at least not on a viral scale like their mistake is known). They will never have a way to redeem themselves. They are gone. What we do know is that, like Lewinsky, they have "lost their reputation on a global scale". The families are quoted in the news stories as saying, "[We] really don't know why the boys chose to do what they did, but [we] blame them both for the decisions they made on this night. If all this stops one person from making the same mistake, then some good has come from showing this video. [We're] hoping it will have an impact on young people and make them see that a bit of fun can have such devastating consequences." I commend the families for expressing concern for others and not wanting others to meet the same fate their children did. The desired positive consequence is to save a life; however, just as "a bit of fun can have devastating consequences", sharing a video of this nature can also have "devastating consequences". When scrolling through the comments, people have engaged in "virtual stone throwing", not at the parents, but at the deceased. The majority of comments are cruel and vulgar. The two young men have been branded as less than human, deserving of their fate. Are these families now twice-victimized: 1) losing their children, and 2) the comments about their deceased children? Furthermore, one of the young men had a 5-year-old daughter, how will the releasing of this video affect her? Will the video traumatize her (she will one day be able to view it)? What about the comments the potential hurt it may generate (it hurts to read cruel comments about ourselves and our loved ones)? Are we (as parents) the ones who get to decide our child's legacy? In making an example of our children, are we subjecting them to public humiliation and unwanted fame? For teens who survive their mistakes, what impact does their viral story have on their future? Will they have trouble finding jobs, always being remembered as "that kid", etc. Should we let our children decide if they want to share their story? Whose narrative is it? With every share of these horrific stories, are we decreasing casualties or are we, ourselves, casualties to the increasing need for shock value? We are already exposed to shocking commercials, posters and speakers, and people still engage in risky behaviour--do these "raw" videos and photos shared on social media really make a difference? Cognizant of the pain the families have endured, this blog post was not written to "socially shame" their decision to share their child's story. This is an unbiased blog post written to explore, ask questions and gather feedback about the impact of sharing these stories in digital spaces (with the potential to go viral). I sincerely wish for healing for the families and their children. This past week I watched the CNN Special Report about #Being13. While it was very informative and I was glad to have watched it, I was left wanting even more at the end of the 60-minute report. I feel like this was part one of what could have been a short series. To its credit, the report was very thorough in laying out all the cautionary aspects of teen social media use (i.e. sexting, ex-posing, addiction, negative body image, unreachable perfection, cyber bullying, social combat, violence, vulgarity, etc). These concepts are very important for both educators and parents to be aware of. What I felt could have been expanded was more exploration of how we can turn this around (from both a home and school perspective) and, more importantly, a report on all the positive ways in which teens are using social media that model digital citizenship and contribute to making our world a better place. Me at 13. Look at that--I loved my phone back then too (and apparently temporary tattoos). A common theme in the online behaviour of teens (featured in this documentary) was the concern of fitting in. It was said during the special report that "the pressure to fit in makes teens act different online". I would argue that this was also the case before social media; teens often adopt and experiment with different personas throughout their adolescence. I think it is important to highlight the fact that fitting in is not something new generated by the rise of social media. I have vivid recollections of being 13 myself, and the desire to fit in has not changed; all that has changed is some of the ways in which teens (and society as a whole) aim to fit in. I guess what I am trying to say is that we must not forget the fundamental issues at hand just because they are happening in a digital space: cyberbullying is still bullying, searching for likes and followers is still the search to fit in, LMFAO is still vulgar language, sexting is still sexually-explicit behaviour, taking 100 selfies to get the right one is still self-consciousness, etc etc etc. Even though these things look different in a digital age, it is our responsibility as parents and educators to be informed and to help teens navigate this, particularly since the implications and social consequences of online behaviour are often greater. Anderson Cooper suggests that, "what happens online matters more than what happens in real life because there are more witnesses." This idea of "witnesses" and the teenage obsession with the image of themselves that others see is a phenomenon that dates back to the 1960s, as expert Marion Underwood points out during this CNN special report. This phenomenon is known as the "imaginary audience" wherein adolescents believe everyone is scrutinizing their every move. I recall going through this stage as a teenager as well. What social media has done is enlarged this "imaginary audience". Today I provided a space for [students] to do the talking; they are willing to talk (a lot) and I LISTENED! The learning I have done in the last few weeks gave way to new conversations that I had with these students; their stories are powerful. For the first time I felt a real connection in beginning to truly understand their on line interactions. The conversations today were filled with hope. I truly do believe that our students can and will become thoughtful, informed and engaged individuals through their online interactions. The #Being13 report featured teens with striking similarities in their online behaviour that was unreflective of positive digital citizenship. While it was mentioned that teens do use social media to support one another, I would have liked to see much more of this displayed. As Kristin Hansen states in her blog, "I want the internet to be a good place. I want technology to help people rather than just making it easier to be mean. I will leave positive comments if I comment, will share things that build people up rather than knocking them down. I will try to show people ways to be better citizens of the internet." Teens do demonstrate digital citizenship and their positive online behaviour is worthy of recognition. Perhaps their positive online behaviour, if given more media attention and greater focus over the negative, will inspire other teens to follow suit. Please see below for just a few of the countless examples of teens influencing positive change through the power of social media. We know the ways teens are engaging in harmful online behaviour. How can we be agents of change, inspiring more and more teens to use social media platforms to display digital citizenship and promote positive change in the world? What ways have you witnessed teens using social media (and technology in general) for positive use? Please feel free to share in the comments! Digital Distraction or Digital Engagement? Is it possible that engagement can look different for different learners? ​Can engagement be mistaken for distraction? I came across a Forbes article yesterday that raises concern over university students being distracted in class and suggested that "as students become more tech-savvy, they're just more distracted inside the classroom." The article discusses professors who are requiring (adult) learners to leave their phones in a box when they enter a classroom and even close their laptop (note-taking device) lids. Some schools have also tapped into software that will block access to e-mail and certain websites. In another recent article, Shelley Turkle also discusses her device-free classroom. Ironically, the Forbes article goes on to discuss an app for the very technology professors wish to restrict in their classroom. The app is called Pocket Points, and it rewards students for not using their phones. The rewards students receive are discounts to various businesses. It appears to me that distraction is being defined as being on a digital device. I don’t know about you (I can only speak for myself), but I was distracted in school long before technology was around--it just looked different. I would doodle, write notes, day-dream, twirl my hair, count the holes in the ceiling tiles, etc. To me it appears they are assuming technology to be the issue, not distraction in and of itself. The article goes on to say that, "some professors feel they need to create engaging presentations to compete with technology for students’ attention." Um… is that really an issue? Or course educators should try to make their classrooms engaging. Granted, it's not going to be a party every day, but sometimes technology can be the key to the engagement they are looking for. The second part of that statement that bothers me is "presentations". Teaching is not just presentations--that style of teaching "is teacher-centred and values learners who sit still and listen quietly and attentively, passively accepting the teacher as the knower and expert" and the vessel of knowledge. We need to shift paradigms here. This could be why students turn to their devices in the first place. Lecture and didactic teaching is being replaced with constructivist, student-centered teaching. Two great books that discuss the constructivist, student-centered approach are Dave Burgess' Teach Like a Pirate and Paul Solarz' Learn Like a Pirate. This brings me back to my initial questions: What does engagement look like? Is it possible that engagement can look different for different learners? Can engagement be mistaken for distraction? I just got back from an AMAZING morning at EdCampYQR. The learning was on fire and the positive feedback keeps rolling in! Once thing I can assure you is that the level of engagement was extremely high, yet there was… "gasp* technology in everyone's hands. Teachers were both engaged and on their devices. How do we know this? They were tweeting up a storm about what they were learning, favouriting sites that were discussed, connecting with teachers both locally and internationally, taking pictures of content, taking notes, etc. The event went so well today, that our committee is planning a second one for April 9th--mark your calendars!!! I guess what I am getting at here is that engagement and distraction can look different for different people. Just because I have a pen and paper, doesn't make me any more engaged than the learner with a digital device. Similarly, just because I have a digital device, doesn't mean I'm distracted. I realize that in K-12 education, we need to structure and monitor student use, as well as promote device usage for educational purposes. However, in a post-secondary setting (like the article references), I think adult learners (who are paying for their own education) do not need to be treated like children. Let them decide if and how they want to use their digital devices. Furthermore, perhaps the instructors should think outside the box for ways to relevantly engage their students with the technology brought to their class. I believe that it would be a disservice to students to keep today's classrooms completely device-free. There is a further danger in not being taught how to use technology meaningfully, as this PBS video illustrates. Our youth/young adults are not digital natives. The digital native idea, as David White asserts, "assumes that we don't have to teach youth how to use technology--but being socially adept at Facebook or owning the latest phone is not a foundation for using the web effectively for study" or developing media literacy and digital fluency. If our students are, in fact, distracted by their technology, then de don't block them from using it--instead we talk and teach them how to use their technology to enhance their learning (not distract it). Again, this ties back to digital citizenship, with a particular focus on Ribble's themes of educate and respect. I recommend reading Gloria Uluqsi's recent blog post on her interpretations of digital citizenship, as an educator from Nunavut who is new to the topic. I am certain that she will bring the concept of digital citizenship into her classroom and inspire her colleagues to integrate it in their teaching as well. How are devices being used in your classroom to enhance learning, as opposed to distracting it? ...or does it have to be one or the other? The two courses I chose to take this semester have shaped up to pose an interesting challenge. Monday nights explore the power of connectivity, media literacy, digital citizenship, and creating a digital identity. Tuesday nights explore disconnecting, being present with the outdoors, and addressing our nature deficit disorder. Monday night, as part of our learning journey, our class went canoeing. Incidentally, this happened to be my first time in a canoe. While I was (literally) trembling with fear, I was excited to try something that I had never done before. Prior to the class, we received an e-mail encouraging us to leave our cellphones behind, in hopes to "connect" with our natural experience. We were also asked to bring something non-digital to write with once we reached Spruce Island. So, off to the store I went to purchase the first spiral notebook I have purchased in well over 10-years. The experience in the canoe was incredible! [I must pause to thank Jillian for being an awesome canoe partner]. The experience had me feeling exhilarated, peaceful, proud (of not capsizing), and… regret. Why? My entire time in the canoe, I wanted a picture. I assure you that this is not a vanity thing… it's a desire to remember that moment. Life is so incredibly busy right now; my mind just can't take it all in. Hence, I love looking at pictures to remember and reminisce. While many people may say "just live in the moment" and "be present with nature", I say, why can’t we both “save” and “savour”? Nathan Jurgenson seems to think it's possible. My first time in a canoe was a special moment in my life… an achievement, really. To me, that is something worth hanging on to. I came across an article this week that suggested one can't "live in the moment" if they have their cellphone out to "capture the moment". The writer laments that "we aren't experiencing life" and "we're losing moments with every tap and swipe." This has become a popular opinion. I guess one of my big questions is... when did the assumption surface that people aren't "present" if they are taking a photograph? I have always had a personal love of photography. I recall many birthday presents throughout my childhood and adolescence being cameras. Never once during my youth was I questioned on being "present" when taking photographs (even if they were of myself). I don't even recall that being a criticism of others in the past either (i.e. look at that person with the polaroid or 35mm camera around his/her neck… why aren't they just "present"?). Is it only once cameras with wifi connectivity and sharing capabilities hit the markets that people started to make this assumption/accusation? Is it more legitimate, or am I more "in the moment", when I take a photograph with my DSLR or point-and-shoot, than when I take a photograph with my smartphone? Why? Is the assumption that taking photos with our phones is surface-level to "show off", or could it possibly be something deeper? Our daughter with her abuelitos. I suppose I take issue when people assume I'm not "in the moment" when I take pictures with my phone. Little do they know that my purpose of taking that picture is to bring other people "in the moment" too. Half of our family lives in Mexico, and at best will see our daughter once or twice per year. They long to be in the moment with their grandchild/niece/cousin, and I am determined make that as possible as I can. When the article I referenced above discusses taking photos/videos of her children, she questions, "Why can't I keep things to myself?" I agree that there are things people post to social media that are TMI (too much information), but I choose not to keep the joy my child brings "to myself"; particularly because it would paralyze the relationship with her relatives far away. I have an (almost) three-year-old daughter who is my pride and joy. I have often been teased (sometimes mocked) that I have "the most photographed baby on Facebook". Yes, that may be so, but this is the only way our family gets to see our daughter grow up. This way, they are barely missing a step in her development. We Skype at least once or twice per week, but our daughter is often in bed by the time they are home from work, so Facebook allows for that asynchronous connection. Truly, Facebook (even though many people give it a bad rap) is a treasured social media platform in our family. I would argue until I'm blue in the face that Facebook has brought our family closer than it could ever be without it. Shelley Turkle asks, "In the process of connecting, are we setting ourselves up to be isolated?" In my personal situation, I think the opposite is true: my daughter would be isolated from her family without connecting. Me, as a baby, with my grandparents. To further illustrate why I think we can both "save" and "savour", I recall the last day of my grandfather's life in 2009. My grandmother (his beloved wife) passed away 18 days earlier. It was indeed a very painful time in my life. When grandma passed away, I grabbed her enormous collection of photo albums and in my 5 days of compassionate leave from work, dedicated myself to scanning each one. There were over 1,500 photos scanned. While going through all of the photographs with tear-blurred eyes, I remember being filled with gratitude that she took so many pictures of their life. I know that she was "present" in those moments as well. It is the dearest gift that she left our family. Grandpa collapsed after Grandma's funeral; when I learned that Grandpa was failing, I decided to create a video slideshow in iMovie of his life. Grandma even had pictures of him as a baby. I burnt the slideshow on a DVD and stuck it in my purse to keep it close to me. When I got the call to come to the hospital to say my goodbyes, there just happened to be a TV and DVD player in the ICU room he was in. I popped in the DVD, and for 20 minutes, my very forgetful 93-year-old grandpa watched his life transpire before him, recalling many memories, all the while with a smile. About one hour later, he passed. Coincidentally, while cleaning out his garage this past week, my dad found a box full of my photographs (there has to be at least 500). I completely forgot about these, and looking through them, I'm just smiling ear-to-ear recalling memories that have faded from my mind over the years. The bonus is that I found even more pictures I took of my grandma and grandpa in there! Of course, we must always strive for balance in our lives. Harmony McMillan and Amy Skuka have some great blog posts on that very concept. Concerning balance, our device usage directly relates to our education. People must be taught how to use technology to enhance their life, not control it. This education starts in the home and is developed/supported in school. It ultimately comes down to sound digital citizenship. I am not arguing to live your life viewing the world through a camera lens, but what I am saying is instead of evaluating someone's "presence" in a moment, we should be considerate of their "purpose". Similarly, we cannot tell a painter to stop painting the roses because he should be smelling them. Although I personally find Shelley Turkle's view of digital connection a tad pessimistic, I do agree when she says, "I'm not suggesting turning away from devices, only that we build a more reflective relationship with them, with others, and with ourselves." “Critics complain that people, especially young people, have logged on and checked out. Given the addictive appeal of the infostream, the masses have traded real connection for the virtual… Instead of being present at the dinner table, they are lost in their phones… [and argue that they need to] detether from [their] digital appendage” (Nathan Jurgenson). This video, I believe, is an illustration of the fallacy of “digital dualism”. It depicts the virtual world being completely separate from the “real” world, so much so, that poor Caitlyn is considered to be an IRL “vegetable”. Unfortunately, many people tend to perceive teenagers in this light: if they have their “glowing rectangle” (Jurgenson) in their hands, they must be meaninglessly connected, disconnected from their environment, socially inept and possess little-to-no capacity for developing/maintaining “real” relationships and appreciating anything non-virtual. It seems a significant lot of society is becoming overly preoccupied with this notion to “disconnect” from the virtual world, instead of recognizing the fact that these “worlds”, albeit different, are not separate. “IRL” and “virtual” are inter‘connected’, and in our continuously-evolving 21st century, we ought to explore how to meaningfully harmonize their relationship and “understand that what we do while connected is inseparable from what we do when disconnected” (Jurgenson). The activity above really looks no different, but one (the newspaper) is certainly seen as being more "socially appropriate". Why is this? Couldn't Caitlyn, too, be reading the news on her phone? Perhaps another issue in addition to this idea of being "anti-social" (because Caitlyn could be social on her device, but not while reading the newspaper), is this issue of being "socially appropriate". It isn't likely that someone will whip out a newspaper while you are in the middle of talking to them, but it is quite common that someone might whip out their phone. That being said, the newspapers don't chime and vibrate for our attention like our digital devices do. Of course, this "etiquette" is something that needs to be taught and modeled, and it is the responsibility of everyone (teachers, parents, and society). Our youth need to "learn" how to use their devices in meaningful and appropriate ways. Of course, this is where the video also illustrates another fallacy: digital natives. It is certainly clear that Caitlyn, despite being born in the 21st century, is not a “digital native”. As David White points out, “being socially adept at Facebook or owning the latest phone is not a foundation for using the web effectively for study” nor for developing media literacy and digital fluency. These are skills that need to be taught, modelled, and practiced—they are not innate, as the term “native” would lead one to believe. The PBS video illustrates this point in saying that "no one is born a native speaker of 'digital' the way no one is born a native speaker of any language”, but with “context, immersion, and practice” they will learn. Using the terms “digital native” and “digital immigrant” run the danger of a generational divide and “coercing comfort into knowledge” (PBS), which are two very distinct things. Just like the digital and physical world aren’t separate, neither is the skill-level and capacity of certain generations; after all, "Wasn't the internet built by people in the age range we would readily label ‘digital immigrant’” (PBS)? I really like the alternate analogy that David White explores: Digital Residents and Digital Visitors; particularly the idea that it is a continuum. Many of our teens are digital residents, whom leave social traces of themselves even when offline. This, again, relates to our pedagogy and practice as educators because it is imperative that we educate teens to examine and purposefully sculpt their digital footprint. Another connection this video has to our course is the recurring theme of media literacy. If you take a gander through the comments, there are many viewers that believe this to be a “real” news story. Again, this demonstrates the need for teachers to stretch their pedagogy and infuse their practice with 21st century skills in order to cultivate their students’ capacity to critically evaluate media all around them. EdCamp is a grassroots movement that is rapidly growing in popularity all over the world. Regina Catholic Schools, Regina Public Schools, and Prairie Valley School Division have come together to collaborate for a grand EdCamp event at the University of Regina on Saturday, October 3rd (next Saturday)! ​An EdCamp is a FREE and innovative approach to professional development. It is choice-based, teacher-led learning. EdCampYQR is designed for educators by educators, with the aim to empower teachers to drive their own learning and to foster professional communities of practice. EdCamps are also called "unconferences". The sessions are developed on the day of the event, based upon the interest of the participants in attendance. EdCamp is open, participatory, and the content is provided by participants; educators learn from other educators through sharing, dialogue, networking, and exploration of 21st century learning. Educators are encouraged to come with an idea, tool, tip, project, or strategy that they feel other educators may benefit from. They are also encouraged to come with a question or something they would like to learn more about. EdCampYQR will be a structured morning of sharing and learning. Educators teaching educators is, arguably, some of the best PD of all! This is an inclusive event—you do not need to be a “techie” to attend. EdCampYQR is a participant-driven conference that is designed to meet the interests and needs of ALL those who attend. Sessions can be proposed on any topic relating to education and learning—technology related or not! The atmosphere at an EdCamp is comfortable and relaxed; if a session you’ve stepped into isn’t for you, simply use the EdCamp "rule of two feet" and walk into another session—no one gets offended! The day is really what you make of it; you can facilitate, listen, share, network—the choice is yours! It all adds up to a personalized, engaging and exciting professional development experience. ALL are welcome... you do not need to be a teacher in one of these divisions to attend. We are hoping many U of R Educational students are able to attend as well! How is Edcamp different from traditional pd? hope to see you at EdCamp yqr! Hello! I look forward to sharing my reflections with you. More importantly, I look forward to learning from the diverse experience and expertise of everyone in this course!